Springfest in Temecula Valley is celebrated all season long with a variety of festivals, events and activities throughout Southern California wine country. Spring is in the air in Temecula Valley Southern California Wine Country. Located just an hour from San Diego and 90 minutes from Los Angeles, Temecula Valley’s Springfest offers visitors the chance to enjoy a unique variety of live events, experiences, and festivals to kick off the season of rebirth. The Temecula Rod Run revs Springfest into action the first weekend of March. More than 600 pre-1974 classic cars cruise down Old Town Front Street each year for the classic “Cruise Night” while Saturday’s Car Show allows visitors to take a peek into the workings of these vehicles parked along the streets of Old Town. The following weekend, March 9-10, 2018, brings Pechanga Resort’s 10th annual Chocolate Decadence & Wine Festival to the region. Visitors to this ticketed event can enjoy a wide array of chocolates and other decadent sweets while listening to live music and sipping on a variety of wines. The Wine Festival showcases notable and award-winning wines from California (including Napa Valley, Sonoma County, and Temecula) as well as abroad (including France, Italy, Spain, Argentina, Chile, Australia, and New Zealand). Springfest finishes the month of March with the Temecula Valley Bluegrass Festival, taking place March 23-25, 2018. The three-day festival will feature an exciting lineup of bluegrass bands, vendors, and camping opportunities at Tucalota Creek Ranch Cellars. This April, don’t miss the 4th annual Taste of Temecula Valley, held the last weekend of the month. The event kicks off with a VIP Dining & Concert experience and continues with family-friendly all-day eating opportunities from some of the best Southern California restaurants, wineries, and breweries. Live entertainment and a kid-friendly fun zone round out the charity event that benefits local students. The inaugural Temecula Blues Festival, taking place April 21, will feature local, regional, and national Blues performers taking the stage in Old Town Temecula. May brings Craft Brew Month, a nod to the region’s exciting craft brewing scene and numerous breweries. Participating breweries celebrate the month by offering specials and live events for the beer-lover. The first weekend in May welcomes the return of Reality Rally (May 3-5, 2018). This three-day charity event, with funds dedicated to Michelle’s Place Breast Cancer Resource Center, features live entertainment and “fun for funds” that aim to help the lives of local citizens facing cancer. Visitors can participate in an Amazing Race style (with teams including reality TV stars), a Lip Sync showdown, Celebrity Chef Showcase, and Poker Tournament. Also in May, don’t miss the Battle of the Burgers (May 18, 2018) where local restaurants compete in Old Town Temecula to create the best burger as voted by the public. 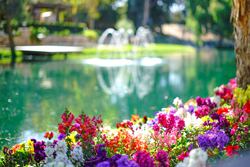 For up-to-date details and information on Temecula Valley’s Springfest, explore VisitTemeculaValley.com.